Assigned 352BS/301BG Westover 12/7/42; Chelveston 9/8/42; flew group’s first mission 5/9/42; Tafaraoui 26/11/42; as MICKEY FINN 11m; transferred 32BS and renamed SPECIAL DELIVERY II total 79m; Returned to the USA Rapid City 398BG (training) 10/11/43; Written off 20/10/44. 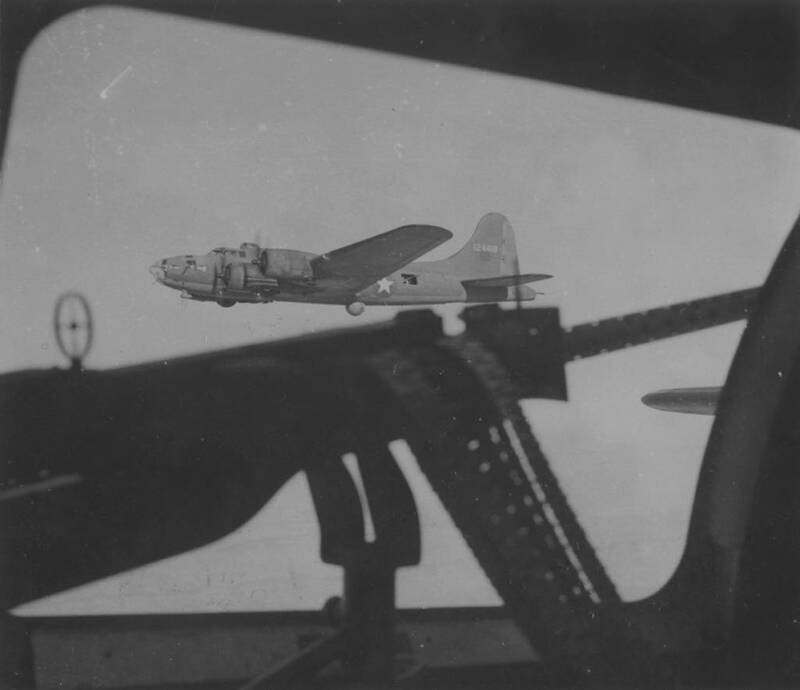 Assigned to the 352nd Bomb squadron at Westover, this B17F was initially named as „Mickey Finn“ and flew eleven missions from Chelveston bearing that name. Lt Walter A Williams flew the Fort on the 301BG’s first combat sortie to Rouen on 5th September 1942. When the group redeployed to Tafaraoui in North Africa, #418 was transferred into 32BS and re-named as „Special Delivery II“ after the originally named Fort suffered flak damage in mid December and was scrapped. 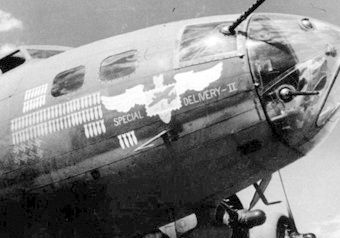 Sixty-eight more missions were completed before „Special Delivery II“ was considered „War Weary“ and sent back to the USA proudly sporting at least eight swastikas for fighter kills. Here it was used to train the seemingly endless line of fledgling aircrews at Rapid City AAB, including men destined for service with 398BG. In October 1944, it was deemed worn out and written off. My dad was ground crew chief on this aircraft at Rapid City AAF from February to June 1944. I have his pictures showing him with „Special Delivery“.